It went OK, except a line that was 5.75" in Inskcape ended up 5.25" on the laser cutter. I'm not sure if this is a scaling problem with Corel Draw import or with something else. The Litiholo Kit is awesome for making holograms at home, but it only comes with one laser. So if you make a bunch of holograms and want to display them all of at once, you are stuck. It turns out this is almost exactly the same spectrum as a "5mW 635nm Red Laser Module Focusable Dot" I purchased from DinoDirect for $10! Did you know there is high-definition digital TV in the air all around you for free? Thomas Edwards, VP Engineering & Development for the FOX Technology Group, will present on ATSC digital TV, including the history of digital and high definition TV, 8VSB modulation, MPEG transport streams, MPEG-2 video coding, AC-3 audio coding, and PSIP program guide data. There will also be a brief discussion of the new ATSC A/153 Mobile/Handheld DTV standard." Now there are some Arduinos with built-in Ethernet. From Freetronics, the EtherTen, which has a Wiznet W5100 chip on board at $69.95. It looks much like an Arduino (including USB port) that happens to also have an Ethernet port. Apparently it works, even with DHCP. Sparkfun has the Ethernet Pro at $54.95, which also has a W5100 but is a little more slimmed down. And if instead of an Arduino, you want a ARM Cortex-A8 board that runs Linux, has 60 digital I/Os, and built-in Ethernet, you can try the BeagleBone for $89. Also in ARM-land is the mBED, ($50.80 from Mouser) which has built-in Ethernet but needs a carrier board with magnetics such as mbed-Xpresso Baseboard ($45.14 with LCD display and VGA out), mbed LPC1768 Workshop Development Board ($25 but barebones), or Mission Control MC-101 baseboard ($45 with lots of screw-down terminals). Meanwhile the coolest PIC board ever is the MikroElectronica Multimedia Board for PIC32MX7 ($149) that has a touchable TFT display and SD card as well as Ethernet. MikroE also has a bunch of dedicated Ethernet boards. Finally there is the good old Modtronix SBC65EC ($65) a PIC-based system that has Ethernet and RS-232. If you are having some trouble with the Dirac bra-ket notation used in Quantum Computing, read carefully this tutorial by Prof. Reddish from UMCP. Caltech has a great class on Quantum Computing whose notes are here. Sean Bonner will present Safecast, a global project working to empower people with data, primarily by mapping radiation levels and building a sensor network, enabling people to both contribute and freely use the data collected. Created 1 week after the 3/11 Japan earthquake, Safecast has deployed 25 mobile, 50 handheld, and 50 static radiation sensors. Carlyn Maw is a co-founder of Crash Space, a hackerspace in Culver City, CA. Carlyn will describe the Crash Space group project "Store Front Music", which allows people who walk past the hackerspace to interact with a music making machine. 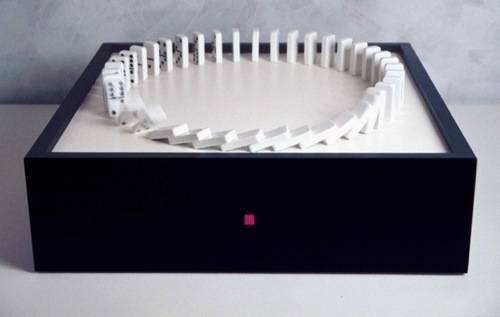 Part sculptor, part engineer, and part choreographer, Jim Jenkins' work primarily features the animation of text and objects to represent a situation or an observation. Inspirations also come from simple movements often found in nature, such as the rhythmic flapping of a bird's wings to the hypnotic swaying of a cat's tail. If you want to get a background in quantum computing, check out Michael Nielsen's courses on YouTube. A few months ago, I was preparing my Second Head for a Crash Space demo table at an event. I was unsure of the lighting, and thought it might be pretty dark there. ARtoolkit does a good job of augmented reality in good lighting, but if the lighting is not good, the system does not perform well. You may remember my previous effort to have a head track you using PIR sensors. Well, it turns out the PIR sensors are great for detecting someone - at first. Then they are useless for 10 seconds. Which doesn't make them great for tracking. So I ended up giving up. The concept is simple: use ARToolkit to track the pan angle of a fiduciary mark, convert to serial data, send to Arduino, have the Arduino set the servo angle of the Robotzone DDP155 pan table. If you miss the VIC-20, here comes the Maximite. BASIC programming, uses PS2 keyboard, VGA out, and based on a PIC32. Prices look aorund $60-$70. In a way it reminds my of my old RVHE boards (which are no longer produced). They were incredibly simple to program in BASIC with a very fast interpreter. They didn't have a keyboard/VGA connection, but did have Ethernet you could telnet into! The Ethernet did not DHCP very well though, so they were not as useful as I was hoping. I've been thinking about ways audio output from an iPhone could communicate with an Arduino. Oh yes, you could use DTMF with an external DTMF detector chip, but what about doing frequency detection without any active external devices? Here is a Frequency Measurement Library for Arduino w. Atmega168/328 that needs some external resistors and capacitors, no active devices needed. A 1:1 audio transformer might be wise as well. Supposedly this works up to 20 kHz! 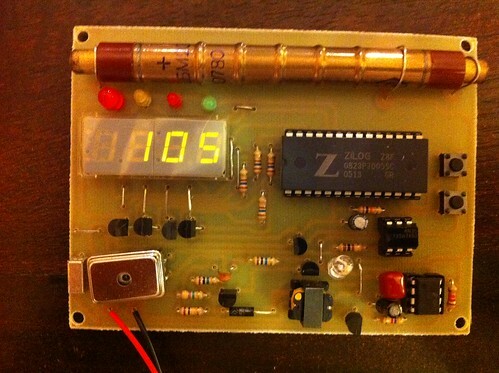 I recently built a geiger counter kit (Chaney Electronics C6981). It can measure the number of times particles of ionizing radiation pass through the tube per minute. So does it work? So indeed, the granite is more than twice as radioactive as the wood! I have often expressed my sadness about the cheap Ethernet shields for Arduino not having working DHCP. Well, it appears there is now an EthernetDHCP Library for the Wiznet-based shield and apparently it actually works. But the Wiznet-based shield is still $40. On the horizon, for $46, is the new Microchip-based chipKIT Max32 Arduino-Compatible that has Ethernet on board - but the PHY/magnetics might require a shield that is not yet released. Some day we will have an easy-to-program microcontroller for an affordable price that can do DHCP! Web Service for Full "Chumbified Ardunio" control? You may remember my PHY2PHY-intermediating web service. It occurs to me that one could have an intermediating web service that exposes all the aspects of an Arduino through a Chumby One. The Chumby could hit the web service every so often (say 1-2 s) to get commands for getting/settings the connected Arduino I/O values. By the way, should an Arduino on a Chumby be a "Chumbified Arduino" or a "Chumbuino"? 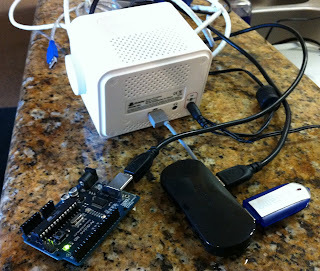 Then everything that the Arduino sends out on Serial to the Chumby goes over UDP to my Internet server. I once had a holography kit a long time ago (for use with my HeNe laser), but never got around to building the recommended stable sandbox for it, and it got lost in a move. This Christmas, Carla bought me the Litiholo Kit. This is the most awesome introductory holography kit ever. First, there is no wet development of the plates. You just expose them for around five minutes, and they are done. 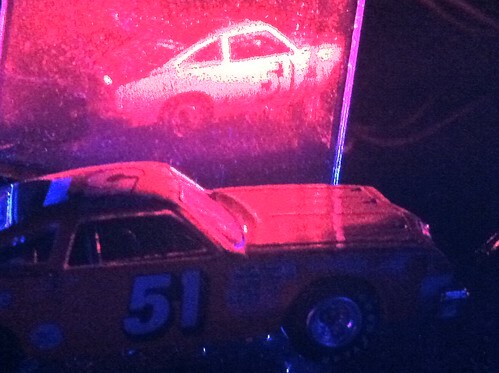 It even comes with a blue LED keychain light to use as a "safelight" while you are exposing the film in the dark with the red laser. The Litiholo Kit uses a known technique for easy holograms - there is only a single expanded beam cone from a solid-state laser. The part that directly illuminates the film plate is the reference beam, and the part that illuminates the object and bounces off of it is the object beam. There is no need for additional mirrors or lenses to steer the reference beam around separately from the object beam. Plus the system is designed to minimize vibration between the object and the plate, which is one of the biggest source of failed holograms. So how was my first five minute exposure? So obviously these are not the best holograms - they are a bit messy, they are small, and because of the angle of illumination you have real limitations on the size and shape of what looks good. But on the other hand, it is incredibly simple, works, and is a great introduction to holography! And boom, I started seeing data coming in from the Arduino. Wow, that was simple! Regarding cheap PHY2PHY (physical to physical interactions over the Internet), I am still convinced that it is hard to beat the Lantronix products for having a solid serial to TCP/UDP/IP/DCHP stack. My best results was with the good old Xport. My results with the Xport Direct and an Xport Arduino Shield have been less than stellar, but it may just be do to the sad state of Arduino SoftwareSerial (even the better versions). Both Lantronix products are around $50. My best results were with Comfile CUBLOC that has two USARTS, one for monitoring the system, the other for serial-to-Ethernet. 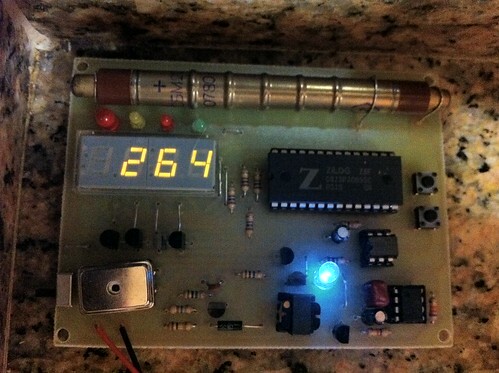 But wait, now you can get the Arduino/Wiring Board-esque Sanguino with 2 USARTS. The Sanguino (no USB) is around $30, the Wiring Board itself is $60 if you need a lot of digi I/O. Then I come upon a new Wind Sensor from Modern Device. The anemometer impeller solution was always kind of expensive plus it took a long time to spin down once spun up. I wonder how responsive this one is? At $17, it is also way cheaper. Christopher O'Leary is an artist who works across mediums including video, photography, sound and installation. Utilizing novel lighting and post-production techniques, the creation of his work is tightly controlled, enhancing and building upon the performative aspects of his projects. 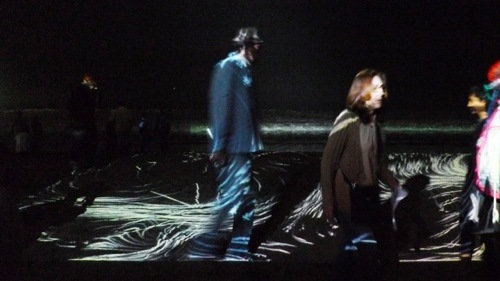 These activities include performance art, computer-vision systems and non-linear videos. Los Angeles based artist Lewis Keller manipulates frequency, timbre and amplitude via performance, installation, fabrication and digital media. His work combines sophisticated technology with crude humble structures, inviting listeners to question their relationships with time, technology, space, sound and silence. He received his BA from Colorado College and his MFA from CalArts. Michael Wilson and Chris Weisbart of the Natural History Museum of Los Angeles will be presenting on the incorporation of DIY and open source technologies in the museum exhibit world, where the need for interpretive and educational technology is often not matched by budgets. The team will present a lecture on projects they have developed for the NHM as well as a current project that Michael and Chris have been working on in collaboration with students at New Mexico Highlands University dealing with the Miller-Urey experiment. I think the OpenServo project is pretty cool! My first scheme on how to do Touch was to read the error voltage from a servo driving the finger to indicate how hard someone was pressing on it. Because of the opacity of the servo circuit, I pretty quickly gave up on this idea, and went with pressure sensitive resistors on the fingertip. Now with OpenServo, I could use the actual position register and/or the back EMF register to try to determine position in a touch-over-IP solution, without having to deal with any funky pressure sensors. Whether this would actually work or not is unclear, as you would need to apply enough touch pressure to either move the servo at least one notch out of position, or enough to increase the servo power or back EMF reading. But the price is right! You know what would go good with the OpenServo? The PIC-MINI-WEB! At $40.95 you get an Ethernet PHY, TCP/IP stack, and it would be easy to I2C over to the OpenServo. Cheap PHY2PHY goodness!